Q: Lewis, tell us about the race? First of all, bad things, what happened at the start? Hamilton: But it wasn™t good enough, I know! Trust me, I thought I did everything I was supposed to do but I got a bit of wheelspin. Q: Tell me about the squeeze, let™s call it the squeeze into Turn One? Seb was coming out the pits with the medium tyres. How did you handle that? Hamilton: I think in the heat of the moment it™s difficult to know from the outside view what it™s like. I felt like I ran out road but I was alongside. It was definitely close but again, as I said, that™s how racing should be and I loved it and I wouldn™t change it for the world. Q: Well done man, your 55th grand prix victory in my home town. Seb, do you think you should have pushed a little bit further? Was it enough? Sebastian VETTEL: I was pushing! I had a really good start, best start maybe at the beginning. I think Lewis and myself we both picked up wheelspin straight away, then I pulled the clutch in again and then I could gain on him so I was really happy with that. Then again the run to Turn One was quite long, but I managed to stay ahead. Then I settled into a nice rhythm, everything was fine. Obviously Lewis stayed out longer, did the opposite, mirrored the strategy so I knew in the end it would be crucial. Then he came out, I was a bit surprised when he came out and it was already so close. I tried to brake as late as possible into Turn One, locked up. I don™t know if we touched but I managed to stay ahead so it was really close. The laps after I was doing everything I can to stay in front and I was a bit luck because there was always a car in front giving me a tow, but as soon as I was alone, he just flew past down the straight, which was a shame. We tried to stay in the race but well done to him, he drove a good race and we did everything we could. Q: Hey man, you™re still leading the championship, so don™t worry, six points in front. Q: Tell us about the Plan C. Was that a real option towards the end - change your strategy and try to attack? Vettel: Yeah, we had a huge gap to Daniel behind, so we could have done anything really. We weren™t sure. Obviously there was a big conversation, trying to do something. We were hoping Lewis would maybe struggle with his tyres at the end but normally in the end of the race the track picks up a lot of rubber and the tyres last long so he didn™t have any problems. We tried to keep pushing, stay close, but it was never close enough. Q: A fantastic drive my friend. Hey, last but not least, come on man, no shoey, just behave yourself, I™m very elegant today. Your favourite podium of the year, first since Mexico 2016, how does it feel? Daniel RICCIARDO: Feels good. We had a little bit of fortune today with Valtteri stopping. We were fourth and then he had his... I™m not sure of what his problem was in the end, but for now we take what we can and it™s nice to be up on the podium. Really happy to spray some champagne again. The weather is good. They said maybe a chance of rain. It™s cool, we got some sunshine, so gracias a todos. Q: Well done amigo. Lewis, was it that hard, because obviously this is possibly the most demanding phsyically? Hamilton: Yeah, this is one of the hardest races. Q: How™s your neck after it? Q: Lewis, many congratulations, win number 55 of your career and your second here in Barcelona and I have the feeling from your celebrations that it meant a lot to you. It was one of those races that was getting away from you but you and the team made it happen your way and from your side making the softs work first and final stints critical to turning it round. Hamilton: Yeah, just! And then after that was just biding my time, trying to find the right opportunity. There were backmarkers we were coming up against, which made it fun. Trying to get past backmarkers is very, very tough and so clocking the DRS with the use of the battery pack and everything... But as I said, these guys have done a phenomenal job, their car is awesome and the pace that he had... it™s very close between us both. But at the end I was able to manage the soft... wow, I™m talking as long as you normally do when you win! Hamilton: But the last stint: when they told me I had 25 laps I didn™t think... at the end of the stint he would come back, being on the harder tyre, but I was able to manage it. Q: ...It was just one of those days that you were trying to catch something that was like a bar of soap, always getting away from you. Vettel: That™s a good way to put it. Well done to him. He won it fair and square, so I can™t take it away from him. Obviously I™m not happy because as you said it was there and... yeah, the start was good. I saw Lewis struggling with wheelspin and so did I, but then I pulled the clutch in immediately and reacted and tried to set off a second launch phase, which worked excellent. Looking in the mirror straight away to see if any of the guys behind got a better start, but I think we probably all overestimated the grip, which wasn™t that good. First stint, I was really in control. Happy with the car, but it wasn™t easy. Just trying to control the gap, the pace was similar. Then we had to obviously go, because otherwise they might go and then you get jumped. I wasn™t sure. I came out right behind Daniel I believe. The second stint I thought was pretty good and then Lewis has the luxury to stay out and then think about what to do, and not being in a rush, gap behind, choosing a different tyre, which might allow him to come back in the end, which unfortunately was the case. Second stint, which you touched on, with Valtteri was... yeah, I was catching him but I knew they wouldn™t pit him. He was all over the place with his tyres so they used him a bit to block me. He still managed to somehow get a decent exit so I didn™t quite make it the first time round so the second time round down the straights I thought œnow, I have to find some way, even if it™s over the grass. He used a bit more of the track. It was really close. I don™t know what is the word, I faked it on the inside, went back on the outside and then on the inside to surprise him, which worked, but I nearly lost the car doing that because I had the DRS open and it was a quite aggressive move on the steering wheel. So I was really happy but then equally I looked down and I™d lost an awful lot of time so I wasn™t that happy becau8se the real fight was with Lewis. Then I don™t know what happened in the last stint because I came out of the pits and I was surprised to see him that close because I thought I had eight seconds in hand. It must have been because you stopped a lap sooner or something. So yeah, obviously that could have bought us a bit of a cushion. Then it was nice he stayed behind and I just managed always the end of the straight, end of the straight, and I thought it would be more difficult for him the longer her tries. But then I had no tow from any car in front and he sailed past. He managed a good exit and he was very quick in the last sector and he went on to win the race. We did everything we could, we tried everything. I think the car was good, nothing to blame there. I think our weekend was a bit scrappy overall. So I think it™s still a very, very good result. Q: Well, you™re still leading the world championship? Vettel: I think I was more focused on the race today. It was very close when we came out. You come out on fresh tyres - I was just guessing. I wanted to stay ahead but I was just guessing on the brake point. It worked, but there was no room for him. He reacted well, because he avoided the contact. I don™t know if we touched? I think we just missed. It was good, because I stayed ahead, so you always take it, but it was really close. Q: Daniel, welcome back. Podium, nice to have you here but 75s behind despite massive upgrades all around is, I guess, a little bit of a cold shower after the champagne-shower. Ricciardo: Yeah, I™ve definitely got a less exciting story that these two guys. I™m pretty envious sitting here listening to the battle they had. But look, firstly, it™s nice to be back up here. Absolutely. But it™s nice to see that at the front there are some battles and they™re enjoying it. As Lewis touched on, that™s a big part of why we race: we want to have these battles and fights. I™m enviously not to be part of that but we™re going to try to work on it. I think today certainly we just have to be grateful that, y™know, first podium of the year, it™s nice. We got, I guess a bit lucky, not sure what the problem was with Valtteri, looked like he just stopped on the side of the track, I guess something with engine failure or whatever but yeah, it™s nice to be up here nonetheless. As for my race, yeah, not any exciting stories besides watching a bit happen in front of me at the start. Otherwise, just trying to manage it. At the end, I felt I was trying to get the most out of it, pushing but yeah, I heard the lap times they were doing at the end, and yeah, we™ve still got a bit to go but we™ll keep working at it, try and stay positive and keep everyone motivated. Q: (Roksana Cwik) Sebastian, another situation with Felipe Massa. What can you say about it? Vettel: No, I like Felipe. He was given me space so nothing to blame on his side. It™s really slippery and then when you get close to the other car, the car in front, I just locked up both wheels. At some point I wish I had a handbrake to get the rear turned. It was really close; I was lucky to not bump into him and damage my front wing. But it™s difficult for him because he gives the space and he just waits for me to go through. I should look at the lines in Turn Ten. Sometimes you are really at the kerb but most of the time you are 1.5/2 metres off the apex kerb there. It was quite slippery and I obviously underestimated that so if anything it was me to blame - but it a bit of a pity because again it was Felipe. Last race we had a bit of a misunderstanding, this one again but he™s very experienced and he knows how to move in these situations, so nothing to blame for him. Q: (Mike Doodson) This is for Lewis. Thank you very much for turning what looked like being a bit of a monotonous parade into a really exciting race - particularly for the incident with Seb. I can see it™s all peace and love between the two of you as usual right now - but I™m pretty sure I heard the word œdangerous from you over the radio. Would you like to go into a bit more detail about that? Hamilton: Not really. In the heat of the moment it feels... when I run out of road and particularly where we went off at the exit of Turn One, so it meant by the time I had... I tried to stay straight but I came over the kerb so I lost all steering and he was just ahead of me. Could have been close, could have been some real good contact but fortunately I avoided it. I didn™t say anything bad, just ˜be careful, that was very, very, very close,™ but I enjoyed it and I™m glad that afterwards I was able to have a battle and didn™t damage anything and there™s nothing lost between us. The respect stays the same. I think he was tough and hard just to the edge and no more. I think if he™d hit me that would have been a bit different. Q: (Angelique Belokopytov - Autodigest) Lewis, congratulations, what were your thoughts when you saw this red guy in front of you at the start and were those thoughts the same after you saw him again after his pitstop? Hamilton: No, definitely not. At the beginning, you™re on the back foot, thinking ˜damn it, we worked so hard, we got a great pole position™. The starts are just so unpredictable. I prepared, I did everything I needed to do for the start and just got a bit of wheel-spin and he got a better start. Naturally, when you go into Turn One and you™ve lost position, you just know here in Barcelona it™s so hard to follow. As you come out of Turn One into Turn Two, Three it™s often kind of like... the chances of winning this race from now, this position, behind such a fast car is... the percentages are very, very small. I just stayed on it, I tried to keep them... y™know he was so fast in that first stint so I just tried to keep on his tail and I think to the end of the stint I was able to start closing the gap to him, and I™m like ˜Oh my God, we™ve got a real race on now™. But what I don™t know is what the overall picture is looking like, so what the engineers see of what our strategy is going to be, and so I have absolutely no idea, apart for our strategy stops, and what they tell me, I don™t know how it™s going to pan out - so all I can do is give it everything I™ve got. It was amazing when I saw at the end that we were coming out close. I was a bit worried that, by going long in the first stint, everything I™d worked for in the first part of the first stint, I would have lost because I think he was pulling me back in at a huge step. But anyway, I trust my engineers and my strategist and they did an incredible job. And y™know, it was great that we were able to have that battle at the end, and again the tyres stayed... the reason we were able to stay so close is that we were offset on tyres. If I had the same tyre as him, it probably wouldn™t have been that exciting. Q: (Flavio Vanetti - Corriere della Sera) To Sebastian. First of all I would like to know if it was an option to make the second stint not on the soft but on the medium like Lewis, and after the race, how is the situation between you and Mercedes? 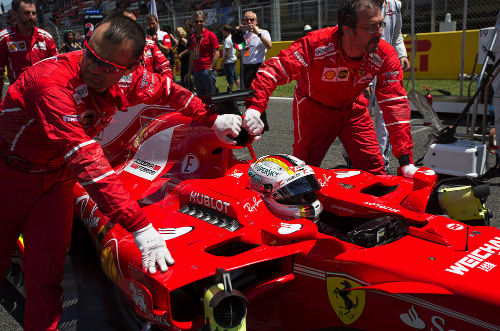 Do you believe that the situation is like in the first part of that they™ve got an advantage on Ferrari? Vettel: There™s always the option, obviously, to go on the medium tyre rather than the soft. We had a new soft and a new medium but yeah, looking back, I was just thinking about it, we obviously lost... I don™t think the decision is to blame. We lost a lot of time fighting Valtteri, we lost four seconds. Then, I don™t know why, we made eight seconds disappear for the second stop. If you add those two things it™s 12 seconds and it would have been a bit better but that™s how it goes. Yeah. I think it could have been the same if we go on the medium tyre. Then obviously they are the second in the row at that point and easy to react, so they could have gone on the other tyre to put pressure and maybe pass us there - so at that point I think there™s nothing to blame. Later on, obviously he had the tyre advantage and he did a good job. It™s not easy to pass but he still made it, so he got close. You saw the race, that™s what happened. So I think for us, to answer your second question, very happy when we have the chance to race Mercedes. They have been proving over and over in the last few years that they are the team to beat. We are given them, so far, a good run for their money. I think we can be very happy - but today we™re not entirely happy because the win was there, the car was quick enough but the way the race happened, it wasn™t meant to be. But the most important thing is that we were there: once again fighting; hanging in there; not much missing at the end. The car is good, the team is in great form and we know that we need to improve. We don™t want to battle with them close, we want to be ahead of them. The idea obviously is nice, to have close battles - but you want to have them in your favour at the end of the race, which today wasn™t the case but that™s, as I said, how it goes sometimes. Q: (Livio Oricchio - GloboEsporte.com) To Lewis, and also if Sebastian can comment, what is your understanding what we saw this weekend. In the race you have a car completely different than you have been using until now and we have a battle with Sebastian as in the four races before. As exactly the same yesterday. Did the Mercedes change the car in the correct way, or was the step forwards not what you expected, or even Ferrari also developed their car in a way that the difference became more or less similar. Hamilton: I think we delivered what we thought we were bringing in - it just looks fancy. It does the job, it works well with our car, it™s just that we have... while the rules are the same the cars are fundamentally a lot different and they™ve been bringing upgrades to the last two races whereas we™ve just bought one here. So, if the brought five piece in the previous race and five here, we™ve brought ten here - but yeah, I think we just made a similar step together. We were slightly quicker this weekend, I think, slightly had the edge. And even if it™s only half a tenth, it™s brought us a little bit... particularly in the race pace. Before I don™t think I™ve really had the pace in the race to keep up with Sebastian. I think today is a bit different - so there is an improvement. Q: (Iolande Skinner - Motosport Monday) For all three of you: what was going through your head as you stood on the podium today? Ricciardo: Relief. And happiness. It™s been a little while. It™s nice, weather was good, the fans were good. So it™s good. Actually I noticed on the in lap, I think it was turn 12, it looked like a dedicated Max sort of fan club, all in orange, and maybe they were doing it for everyone but they seemed to actually give me a lot of love so... they seemed pretty cool so obviously they were still hanging around and showing support. I™m sure they support Max but maybe, as a team, they love Red Bull so that was nice to see. Hamilton: Just grateful, grateful for... it™s difficult for you all and people watching to comprehend what goes on in the background to enable days like this to happen. Every week, I go back to the factory, I get an opportunity to go and see different departments and catch up with people that I™ve obviously known for the five years now and just see how... there™ s people who have been there for 25 years, 29 years and it™s just remarkable to see what goes on in the background and then we turn up at a Grand Prix and it looks all glitz and glamorous but so much work goes on behind... this is just the tip of the iceberg here, so I think on the podium I was just grateful and I just got to race an incredible race today and I™m very proud of my team and grateful I was able to deliver what I know was in my ability in my heart as well. It was just a combination of all that plus just massive excitement, kind of on the rev limiter. Hamilton: I™m glad you didn™t want me to win! Vettel: They did to me! They gave me a good wave. Ricciardo: They had these things, sticks. It™s not love for me then, it™s love for everyone. I can spread it. Q: (Dan Knutson - Auto Action, Speedsport) Daniel, talk us through your start and the first couple of corners. There was quite a bit happening right in front of you there. Ricciardo: To be honest, my start sounded similar to Lewis™s. It felt like the first part of the launch was OK. The guy closest to me was Max. That first part looked competitive, relative to him and probably Kimi in front and then that second phase, picked up some wheelspin and we all kind... it felt like we all slipped behind each other and then tried to get a tow down to turn one. I remember kind of looking at the inside and let™s say committed to that line but then there was I think three abreast in front of me so there wasn™t really much I could do and from memory, I think Max kind of went from inside-ish to the near outside and I think tried to go around them and I think just three into there... they all tried to outbrake each other from what I could see so then there was that contact. I guess Kimi and Max made more contact and then they went off then I slipped into fourth. From that point on, I could see, I think, Kimi... I realised Kimi was out of the race quite early. I wasn™t sure where Max was but obviously I realised my position there was probably going to be a lonely one for the next 66 laps and the fourth turned into third with Valtteri™s - I guess - mechanical. As I said on the in lap, obviously we™ll take what we can for now and that was pretty much it. Q: (Jacqueline Magnay - The Australian) Lewis and Daniel, the race seemed incredibly physically demanding and Lewis, halfway through the race you sounded exhausted - I don™t know whether you were. I™m just wondering if both of you can comment on the physical demands of this particular track? Ricciardo: Seb doesn™t look tired!? No, the pace was a bit quicker than previous years so you know, you feel a little bit more but I think we™re going to come to races, Singapore, Malaysia, it™s more the hot ones, I would say, the more physical so today was yeah, not too demanding, let™s say. I feel pretty good right now. Hamilton: I think it™s dependent on what kind of race you have. A lot of the races that we do with the type of racing that we sometimes have to do, where you™re saving fuel, like in the last race for example. I couldn™t push, the car was overheating, whereas today it was.. from turn one to the end it was flat chat and so those races are the most... you™re just using everything you™ve got so for sure, in that first stint, for instance, to keep... to stay on Sebastian was a killer. Also I don™t carry drinks in my car either to save weight so I™m not having a drink through the race. And then at the end, I used everything I had left when I jumped into my team and my heart rate hit the ceiling. I was good when I got out of the car but jumping into... I don™t know if I will do that again. I was a little bit tired after that one. Vettel: If I may add, thank you very much for not asking me the question. I take it as a compliment. Maybe we can exchange phone numbers after the press conference and maybe it™s a good match to the car, it doesn™t look so flashy on the outside but it™s really good on the inside. I take it as a compliment, thank you. Q: (Sef Harding) I just want to get an assessment from you guys, all three of you, of the weekend because there are some new additions to the fan area to enhance the F1 experience for fans. I just wanted to get you guys™ thoughts on these new additions? Do you look forward to more opportunities for fans to engage with you guys? Obviously what we saw after qualifying was something different. I just wanted to get your thoughts on it. Hamilton: I think this weekend was... what did we do different? We just did the one thing at the end of qualifying, I think it was. What was the other one? Hamilton: I think the interaction with the fans was definitely better. I think there were less fans then I remember being here. I think maybe when Fernando was battling at the front, the place was packed. There was still a lot of seats... I would imagine it was 65-70% full, I would imagine, something like that. So we™ve got to encourage more to come and I™m not quite sure why more don™t come but the ones that were here... when you come through turn seven, it™s completely packed up there. We™ve just got to continue to engage... like what they™ve done with the entry to the paddock, some fans could come and be close in. We™ve just got to keep coming up with ideas to try and bring people in and not seclude them. This is a sport where you just can™t really get very close and the pit lane walkabout was really great but we somehow need to do more. Ricciardo: I think in the paddock, at least they™ve started with the idea of having a bit of a bar area. I thought that was a new addition. I think that™s cool because we all have guests coming to races and whether it™s friends of ours or there are celebrities or whatever they always hang out with the team they™re invited by but if there™s a more social area then you™ll get everyone hanging out in the same place, so I think that™s cool, so it™s a bit more laidback environment which is cool. I question: is it still called a bar if it sells non-alcoholic beer? Does it turn into a cafe? Vettel: Don™t you ever read the signs on the track? Never alcohol behind the wheel. Hamilton: Really? I don™t see it. Ricciardo: But they™re heading in the right direction. I definitely feel that, there™s some positives. Vettel: Did you see that? There is that Heineken. Hamilton: I didn™t know that. Vettel: Did you notice that they painted the kerbs blue in sector one? Hamilton: Yes, I noticed that. At turn three. Ricciardo: Only because you were on them when you pushed him there.